shapes and sizes, which we appropriately deemed our secret garden. Of course, those were the younger years spent at this place that I like to call my second home. I remember family and friend get togethers and grilling at the centre court pool, having margaritas (actually we had soda in margarita glasses), etc. playing monkey in the middle in the pool, squirting each other with these large long squirt guns my mom found in the dollar store, playing marco polo in the large main pool, collecting conch shells in March on the beach and bringing home bags and bags of them. We actually love the beach more in the off-season. The weather is actually beautiful in the fall at the beach and we feel like we own the whole beach! As I grew up the activities changed, but the place stayed the same. 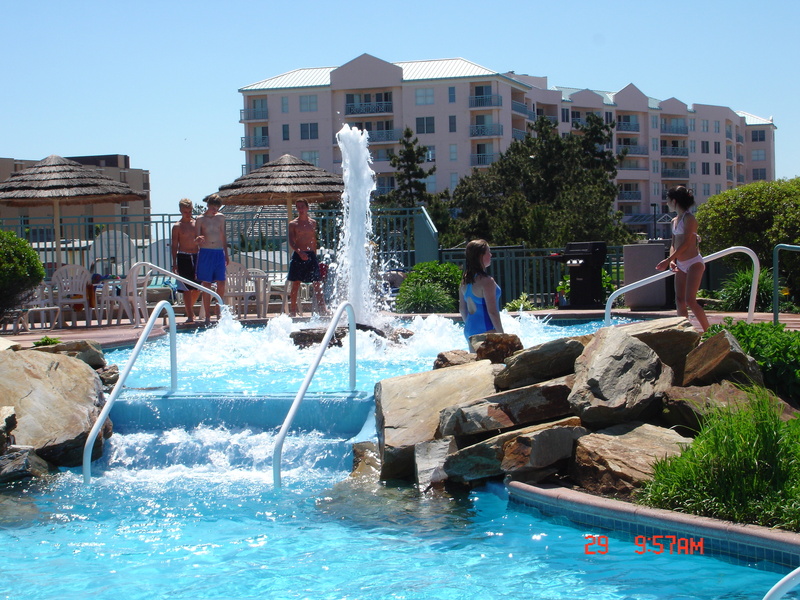 I began to enjoy taking long walks on the beach beside the water, playing a quick game of tennis with a friend, walking to the boardwalk and enjoying the various shops and rides, soaking in the hot tubs, and of course just enjoying the sunshine. To this day one of my favorite activities to do at Seapointe is simply sitting on the beach for hours just watching the waves envelope the sand and writing songs. It is one the most peaceful things you could ever experience. There is nothing quite like walking the boardwalk on a Friday night, peering in the shops and gazing at the wonderfully bright twinkling lights glowing on the rides. Each ride holds a special memory for me, and one of my favorites happened on Dante’s Dungeon with one of my best friends. Now, this ride is supposed to be okay for people of most ages, starting at around 12, but don’t be fooled by that, because I was 17 and I nearly wet my pants. I don’t know whether it was the fact that it seemed it would never end, or the creepy haunted house characters, which seemed to follow us around, but either way it was most definitely a frightening experience. Even though the ride scared me at the time, it gave me something to laugh hysterically at later, and even helped me bond with one of my best friends. My family has tried other hotels and condos along the way, but as soon as we tried Seapointe we were hooked. I have found it to be a friendly, easy-going environment where kids and adults can a have a great time. Whether you are a bachelorette party, a basketball team, a group of spring breakers, or a family with kids, you are bound to enjoy everything that Seapointe has to offer. Vacations are about creating wonderful memories with special people, at great places and Seapointe Village in Wildwood has been the place for me to create those memories. Seapointe Village has been and hopefully will always be my own personal oasis. It is truly my escape from the world and the everyday stresses of life. It's December as I write this and two of my friends and I are going there tomorrow to relieve the stresses of college finals that we just went through.